Sample or store various product formulas in this 5 gram stackable base jar. 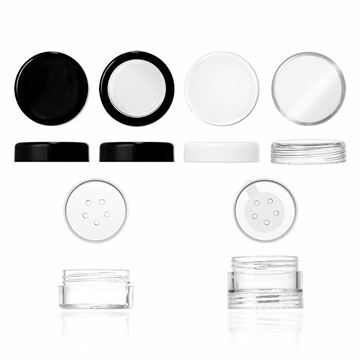 Fits with corresponding stackable jar (Part # 29595), caps (Part #’s 29574, 29575, 30036, 30037) and sifter (Part # 29576) or sifter with sticker (Part # 29577). Jar capacity changes to 3 gram when used with sifter.